This weekend I’m grading exams. Far, far too many exams. It’s a difficult enough exercise to begin with, especially because I’d much rather be working on my latest novel (I’m 24,000 words in). But then I get unintelligible handwriting, inability to follow simple directions, atrocious mangling of the English language, and flagrant disregard for reality. For example, I have learned this weekend that Christopher Columbus founded the United States, that the Nazis tried to kill all the Jews in Germy, that a person might be concerned about the possibility that events will sparrow out of control, and that there exists something (I’m not sure what it is) called a futurity. Today I’m interviewed on M.R. Gott’s blog. Come have a read! There are some great questions. 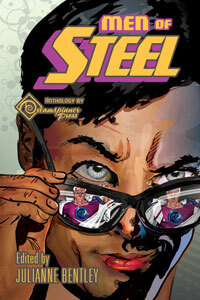 My short story “Act One” will be published in Dreamspinner Press’s Men of Steel anthology. The anthology will be released in April. In the meantime, here’s the cover. Congratulations to Jason and Stella, who were randomly chosen as the winners in the Valentine’s Day contest! They’ll each be receiving a set of the Praesidium trilogy. And thank you very much to everyone who entered! February 5 is the last day to get Flux for free in Kindle format. I am in San Francisco this weekend, having a Mental Health Weekend, which means hanging out with friends and eating good food and shopping and people-watching and writing. My wonderful husband is holding down the fort at home with the kids (and eating at Hometown Buffet). This is one of my favorite cities in the world, and, after visiting a lot of places, I believe it has the best people-watching anywhere. Like tonight, when I saw a guy dressed as a clown share a joint with someone and then juggle fire. Or this afternoon at the Caffe Trieste, when a drunk walked in, dropped a glass bottle, and yelled something unintelligible about Italy, and the guy at the counter smiled, called him by name, and told him to chill. Or the clerk stuck working at Walgreens on Market Street on a Saturday night, who was amazingly cheery and friendly. The entire Praesidium trilogy was inspired in part by this city, and the cover of Flux as well as the front and back covers of Equipoise have photos taken here. Points for anyone who can identify the locations! Today through February 5 only, Flux is FREE on Kindle!